Snacking on Rold Gold Carmelized Pretzels – a delicious surprise! Yep, I’m trying another snack item and I have to say, I had reservations about this product. Truth be told, I wasn’t interested in them but there was a sale at the grocery store so I picked up these snack pack Rold Gold Carmelized Pretzels to complete the deal. I didn’t have any high hopes because I’m generally not a pretzel fan (I find them too salty) but hey, as the main tester for thingsthatwedo.com, I knew I had to be adventurous and test them out! So, the question is, were these Rold Gold Carmelized Pretzels worth buying and how did they taste? 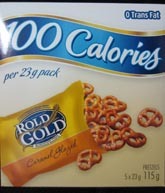 Each box of Rold Gold Carmelized Pretzels comes with 6 individualized snack packs, 23 grams each with 100 calories per pack. So, I wondered to myself, will I just be eating cardboard? Surprisingly enough, these Rold Gold Carmelized Pretzels were really really tasty! For me, they weren’t too salty at all and they definitely weren’t too sweet either. I found them to be classically crunchy like a pretzel but not as salty and the hint of sweet caramel really helped to balance the flavour. Not only that, the caramel coating also added an extra snap factor to the crunch. I have to admit, I was impressed with the well balanced sweet and salty flavours. On top of it all, I felt like I had quite a few pretzels to eat for a 23 gram pack so it was satisfying too. Did I want to crack open another pack? Absolutely but I refrained (barely) from doing so. Let me end off this Rold Gold Carmelized Pretzels review by stating the obvious. This review is by ThingsThatWeDo.com and no one else. If you see this review anywhere else except on my site at thingsthatwedo.com, know that I have not consented to having any part of this product review (or this website for that matter), to be re-produced, copied, or re-printed anywhere else. It’s sad that I now have to be mindful of using such language to make sure others don’t just swipe away the material that I’ve so carefully typed up. I mean, after all, who’s the one coming up with all these opinions? Me, of course! Me, myself, and I here at thingsthatwedo dot com! Like this review from thingsthatwedo.com? Let others know: Tweet it! Yep, I’m trying out another snack and I have to say, I had reservations about this product. Truth be told, I wasn’t interested in them but there was a sale at the grocery store so I picked up these snack pack Rold Gold Carmelized Pretzels to complete the deal. 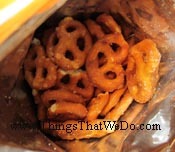 I didn’t have any high hopes because I’m generally not a pretzel fan (I find them too salty) but hey, as the main tester for thingsthatwedo.com, I knew I had to be adventurous and test them out! So, the question is, were these Rold Gold Carmelized Pretzels worth buying and how did they taste?